We rolled right in to July with perfect Summer weather. Our CSA share started too, and we’ve been enjoying a lot of wonderfully fresh organic fare, including some large and sumptuous heads of Bok Choy (Joi Choi). I promptly split one in half, dropped it on a searing hot grill and called it dinner. I’m not shy about grilling just about anything, and being the majority Grillmaster in the house, I get to experiment a great deal with whatever crosses through our kitchen. Several years back we went through a Grilled Guacamole stage, where I grilled up avocado, tomato, onion and even lime halves before mixing them up together. If you haven’t tried it, I encourage you to do so. It elevated the simple and delicious Guacamole in to a smoky and intense dip that you’ll go absolutely wild about. I’ve grilled just about every vegetable purchased too, and like roasting, grilling brings out the sweetness of them, with the added bonus of good smoky flavor. One of our favorite meals is a whole array of grilled vegetables, like portabella mushrooms, eggplant, zucchini, pepper, and onion that we stuff in to thick ciabatta rolls, slathered with my homemade roasted garlic mustard, or we chop them and mix with cooked quinoa for a lighter meal. My boy will happily down a large bowl of grilled vegetables with quinoa, even when it contains a particular one he may never consider eating by itself. We love making grilled quesadillas too, stuffing tortillas, with a sprinkle of cheese that are then placed back on the grill to heat. I’ve grilled all sorts of fruits, even apples in the Fall. My favorite has to be grilled peaches with vanilla bean ice, but my least is grilled watermelon. I like my watermelon ice cold, not warm. The grilled Bok Choy isn’t a new thing with me; previous Summers have seen this delightful dish in the form of Baby Bok Choy that I’ve found at the Farmers Market. A bargain for a dollar a bunch, the baby heads, often numbering up to eight in these bunches, are perfect for the grill and cook up in minutes, including the stems, tender enough to eat without much attention. Split your Bok Choy heads in two, keeping the root end intact. 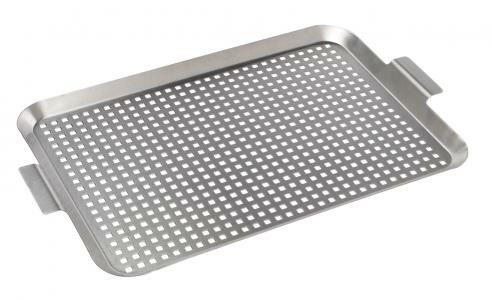 This will hold it all together as your grill them. Rinse out any excess dirt and pat the leaves dry. Rub them gently with a bit of olive oil, salt and pepper. Your grill should be hot, but not flaming. If you are cooking a meat option, wait until the meat comes off the grill to rest, then cook the Bok Choy, burning off any grease residue beforehand. 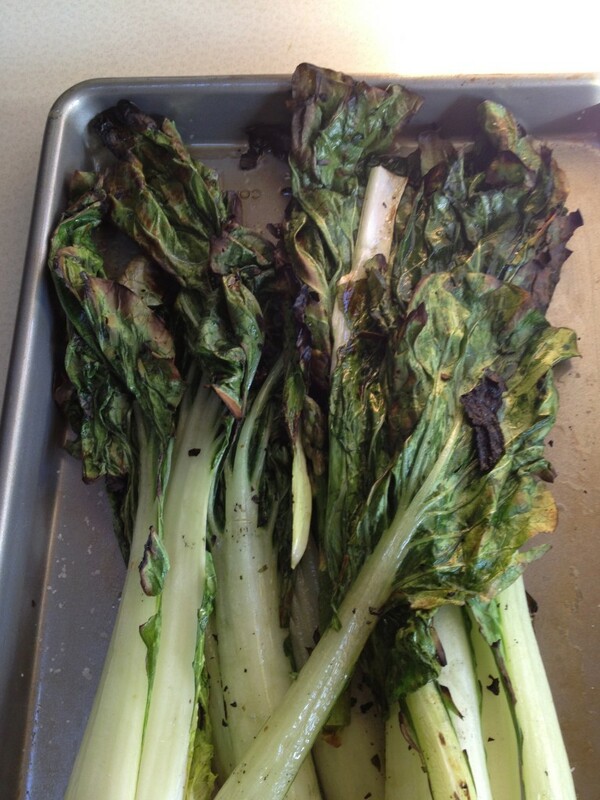 Place the Bok Choy cut side down on the grill, then close the lid for about five minutes. Flip the heads and cook for a few more minutes. The green should turn dark green and wilt slightly, with some char on the edges, but take care not to let them burn outright. Turn the heads so they cook evenly and remove them when all the greens have wilted. Place on a cutting board and slice away the thickest stems, then chop the greens and season as you wish. You’ll get delicious and toothsome taste, a bit of char and smoke and tons of flavor. If Bok Choy isn’t your thing, try grilling Romaine heads, Radicchio, Turnip Greens, Beet Greens, Chard…… the possibilities are endless! Do you have a favorite vegetable or fruit you like to grill?? Please share! Hi Kate! I recently grilled romaine and black plums – both turned out spectacular. I’ve been experimenting with the grill more often and looks like I need to try bok choy. I bet this would be great with a miso dressing. Wow you are adventurous on the grill! 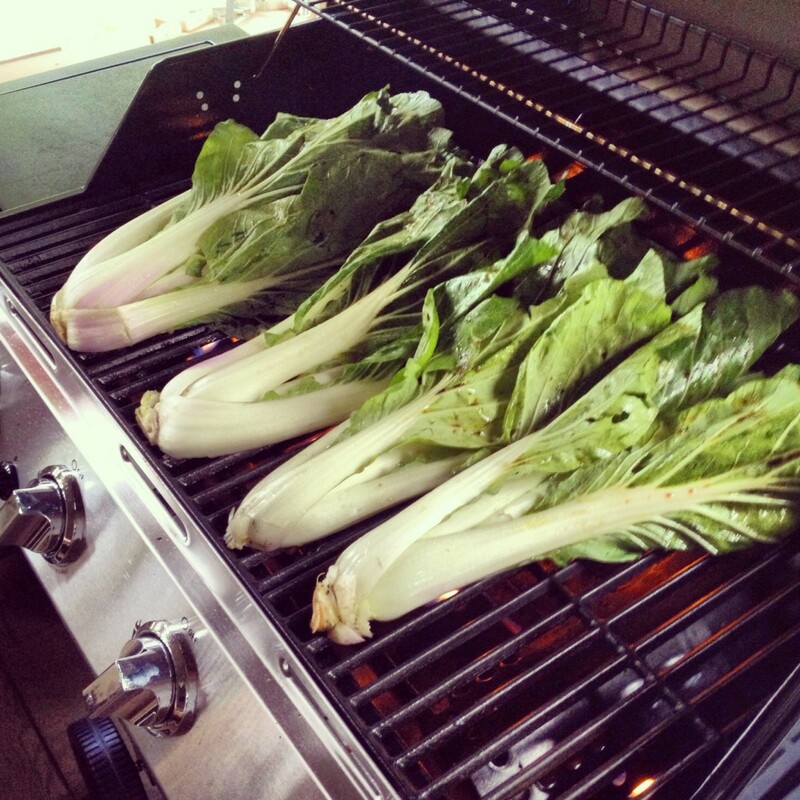 I love the sound of so many of these ideas, Im getting bok choi next time we grill!